These days, it's a tall order to find high-quality pottery crafted here in the USA. 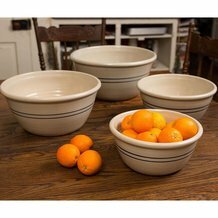 These stoneware bowls will last a lifetime and become family heirlooms to pass down from generation to generation - and that's the kind of quality that can't be bought in a big department store. Set of four bowls: 10", 12", 14" 16" OD. Helpful Hint: If you're storing these bowls inside each other, place something in between them to help prevent scratching, like a paper towel. We're so pleased to offer you this set of beautiful, heavy-duty stoneware bowls. The huge 16"OD bowl is the largest we've seen and holds a whopping 44 cups - that's 2-3/4 gallons! 10"OD Bowl - Holds approx. 12 cups, 3-3/4 lb. 12" OD Bowl - Holds approx. 20 cups, 5-3/4 lb. 14" OD Bowl - Holds approx. 29 cups, 8 lb. 16"OD Bowl - Holds approx. 44 cups, 11 lb. Note: Since these items are made by hand, dimensions may slightly vary. My set of 4 bowls arrived in perfect condition just yesterday. They were very well packed so nothing could have hurt them. It was my first purchase from Lehman"s so I was taking quite a chance with this leap of faith but I was not disappointed. Now, as far as the bowls go... be very careful. The 16 inch bowl is HUGE. Mine came and I realized I had to give up the space of an entire cabinet just to have a place to put it. The 14 in bowl nests so tightly in it that I had to place a dishtowel between them just to be able to lift it out when I needed to. If I had it to do again, I would order only the 14, 12 and 10 inch bowls. Trust me, that 14 inch is a giant itself. The shipping weight on these 4 bowls was 39 pounds so when they get there, be sure you have room for these 2 biggest ones. Still, I am proud to have them. I ordered a set of crockery bowls and when they arrived one was broken. You were wonderful! You immediately sent a replacement, I was thrilled with your service!!! These are truly a work of art. I have wanted these bowls for two years and finally went out and bought them. If you do any kind of double batch recipes, these are the bowls for you! I like to make homemade sweet potato dinner rolls and I like to double the recipe, because they freeze well. The largest bowl worked great! Good buy- they would make a lovely wedding gift. Wow! Out of the box, these are nice heavy mixing bowls. Nice finish. Wide flat bottom for stability. The packaging was outstanding as well. They arrived in Alaska without any breakage. Really glad I bought these. I saw these bowls in use at a local farm festival and had to have one for my batch bread making. I ended up ordering the 14 inch bowl and absolutely love it. Unfortunately, about two months into using it a crack developed vertically down the side. A year later, the bowl is still cracked but still in tact. I hope that it doesn't break any time soon because I rely on this bowl for so many more applications other than the bread I ordered it for. When it does succumb to the crack's weakness, I will have to save up for the 16. Many thanks to Martinez Pottery for continuing to make such useful and classic stoneware. I ordered the 16 bowl and it shipped separately from my order, it arrived fully intact, was carefully packed for the journey to my home. Thank you to ensure safe arrival of fragile items! I ordered the set of bowls plus the stoneware pitcher when they arrived I was very pleasantly surprised at how well each and every bowl was wrapped as well as the pitcher. They arrived in short order and where in great shape. Thank you Lehman's, I love my bowls and pitcher and they remind me of an era gone by. Plus they are very heavy duty. I make bread weekly, and I always dread the floury mess of kneading the bread on the table. I thought a bowl big enough to mix and knead the bread would work. When I found Lehman's just happened to have the Heritage Blue Stripe Stoneware Mixing Bowl which holds 44 cups, I placed an order. The bowl, in addition to being pretty, more than met my expectation of being able to knead bread in a bowl. I love it! Finally a bowl big enough to mix foods. Love it! Great product. I find the glaze finish on the inside of the bowl a bit rough. It should smooth out over time. The first bowl I got was poorly packaged and was smashed to smithereens. The folks at Lehman's were understanding and promptly sent me another one. The second one was much better packaged. We bought six of these about 3 years ago; three 12, two 14, one 16. They've gotten almost daily use. Both of the 14 and one of the 12 have cracked. Not exactly handed down for generations durability, but there's not a lot of other choices out there. I have the set of 4 and have been using them now for about 4-5 years. I use the largest 2 often in bread making because I can make a big batches without ever worrying that the dough will fall over the sides. The smallest bowl, which I use constantly, has some light crazing, but not bad for the abuse I put it through. I needed a larger-than-life bowl for a bread recipe I make over and over again - the bowl itself is perfect - it is very heavy, but I knew that - the only complaint I have is that I can never slide the bowl on the counter (corian) because it scratches - it's a rough surface on the bottom. I received my set of 4 bowls about 2 weeks ago. These sturdy bowls all fit together nicely for easy storage. They truly have an antique-store look and feel like they are well made. I have been looking for quality mixing bowls for a while. I previously purchased bowls elsewhere that quickly chipped. I have been shopping around for quite a while but have not found anything on the shelves that compare to the feel of these bowls. I highly recommend! Product great. Shipping is horrible. The 16 inch bowl was broken, still waiting for a replacement. I think the 16 inch bowl should be packed separately and not stood on edge in the box. Please review your packing techniques as I get the feeling breakage on the largest bowl is not uncommon. Beautiful bowls. Have the slight imperfections that you would expect from hand thrown. Makes them even better! The largest bowl is huge!!!! I agree with all the previous reviews. I address the unequal nesting by putting a folded dish towel between each bowl. Keeps them safer as some are not quite a perfect round etc. Beautiful hand made look! Love the large mixing bowl. It is huge! The first one broke in shipping but I called and customer service was WONDERFUL!! I had a replacement a few days later and am thrilled with this bowl! A must have for any serious baker! This is an excellent product at an exceptional price. This is the only retailer I have found that sells a bowl this large. Also, the service was above average. I would urge anyone looking for something like this to make the purchase here. These are the best bowls. It's hard to find this kind of quality nowadays. They remind me of old pottery like Robinson and Ransbottom. I coveted these bowls for a while before buying them. The largest had flaws in it when I got it. Lehman's replaced it with no problem. GREAT CUSTOMER SERVICE! But then they did not snuggle right. It has been less than a year and the 14 inch one has cracked, so I came by today to replace it. Granted I use them like everyday, but I did not feel like I did anything bad enough to crack it. I am also getting a second 12 inch, as it my original 12 inch lives in the fridge with eggs in it.